This transformer is your perfect partner on site and is the most commonly used for running handheld power tools such as drills, saws etc. 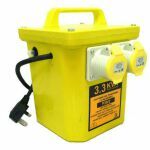 3.3kVA portable tool transformer. Made to comply with reduced low voltage regulations ensuring safe electrical supplies on site. Reinforced IP44 GRP portable case c/w carry handle. Double-wound design for mains isolation. Insulated splash proof GRP portable case (IP44). 110v centre tapped to earth (cte) secondary winding to reduce the risk of shocks. 2m Input flex (1.5mm HO7 RNF) fitted with moulded 13A 3pin plug (BS1363). Input thermal magnetic trip (hand resettable) reducing the chance of overload. 2 x output 16A 3pin socket (BSEN 60309).